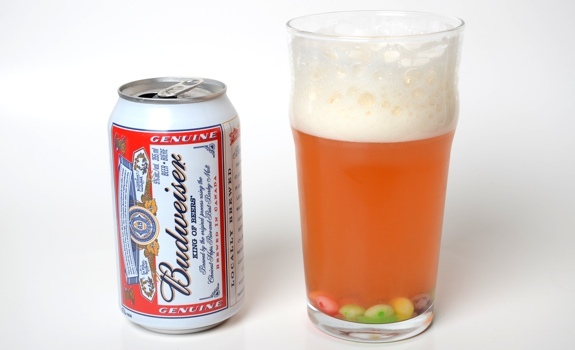 Skittles + beer = Skittlebrau. Simple math, that. Homer: I’m feeling kind of low, Apu. Got any of that beer that has candy floating in it? You know, Skittlebrau? Homer: Ohh. Well, then just give me a six-pack and a couple of bags of Skittles. Ah, Skittlebrau — that most mythical of D-I-Y American fruit beers. While the Belgians have a long, proud tradition of adding all sorts of fruit to their beers, the rest of the world has been adding Skittles to beer since Season 9, Episode 6 of The Simpsons, when Homer first proposed the idea on national television. I’ve always been curious to know what exactly such a concoction would taste like, so I thought I’d buy some Skittles and a six of borderline beer to try some variations on the theme. I don’t expect it to taste good, but I’m hoping it’ll at least taste interesting. – One six-pack of 355 mL cans of Budweiser. – Several 61-gram bags of Skittles. I will add the Skittles to the bottom of a 20 oz. pint glass, then pour the can of beer into the glass. To keep things simple, there will be no stirring. I will keep the Skittles/beer mix in the fridge for the set amount of time. To preserve my taste buds, I will not eat the Skittles at the bottom of each glass. Also, I will make sure there are an equal number of all five Skittles flavours in every test. Skittles turning to mush at the bottom of a glass of beer. 1. Control: Straight-up Budweiser: Remarkable in its blandness, but solid in its ability to quench thirst. It’s known as a lawnmower beer for a reason. Most crucial to this experiment, the flavour is exceptionally neutral, so any other flavours that the Skittles add should stand out. 2. Skittles (15) in glass of beer, left to steep for 20 minutes: Looks like a cloudy pale ale, and tastes like creamy, medicinal, bitter cough drops. The flavour is strong enough to ruin the beer, but not strong enough to dominate. Added some sweetness, but mostly tastes like chemicals. That said, the closer to the bottom you get, the stronger the Skittle flavour, which almost makes it taste like a particularly vile vodka/malt cooler. 3. Skittles (15) in glass of beer, left to steep for 60 minutes: Even more disgusting. Tastes like bitter, watery chemicals with very little fruit of any kind. It’s a cloudy pink colour with white flecks near the surface. 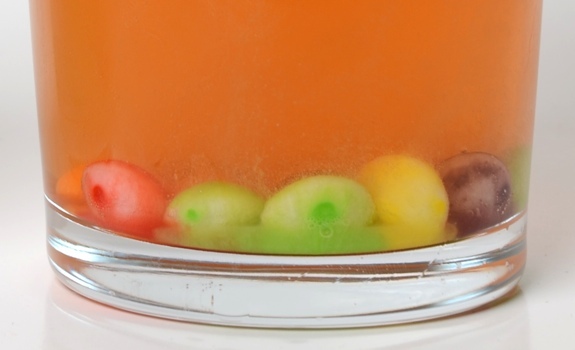 It’s also become flat, and the Skittles have largely dissolved into a sludge at the bottom of the glass. I can’t believe I’m drinking this. What was I thinking? 4. Skittles (30) in glass of beer, left to steep for 60 minutes: Lots of fizzing when the beer is added to the Skittles, leading to a foamy head that kept growing. The taste is at once both better and worse, in that you can taste the Skittle sweetness right away, but it quickly becomes far too sweet. The familiar chemical taste remains a distraction. Similar to the other 60-minute steep, but more intense. Gross enough that I had to dump the last 1/4 of the beer. 5: Skittles (15) smushed with a knife on a cutting board, added to beer, left to steep for 20 minutes: The idea here is that the extra surface area of the smushed Skittles will accelerate the infusion. The result? The first sip wasn’t as sweet and strange as I was expecting, but the chemical twang was still there. The further down into the bottom of the glass (closer to the partially dissolved Skittles) you get, the stronger the flavour. I don’t think the smushing had much of an effect. The longer the Skittles are in contact with the beer, the more nasty the concoction gets. Also, more Skittles means more flavour, though that’s not a good thing. Even at the lowest dosage, it’s pretty terrible. An interesting experiment, but I’ll stick to keeping my beer and Skittles separate. Expect lots of foam if you try this at home. But don't bother trying this at home, eh? You'll waste both beer and Skittles, and that would be a shame. Cost: $12.99 for a six-pack of beer, plus $1.49 for each pack of Skittles. Value for cash money: Terrible, considering the result. 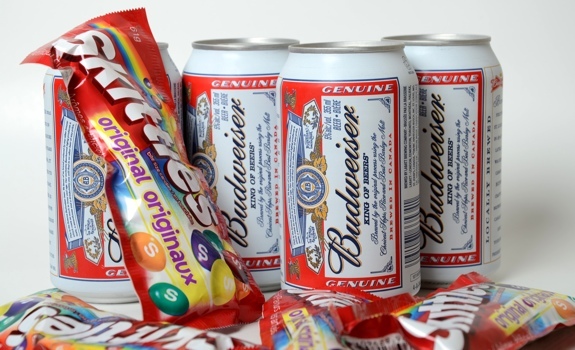 Availability: If you’ve got Skittles and beer, you’ve got the potential for Skittlebrau. Disclaimer: I’m not a scientist. I’m sure this experiment is full of flaky variables that need isolating. Whatever. The verdict: This was a terrible idea.